Raina Lampkins-Fielder: Let's start from your beginning-- what or who initially encouraged you to become an artist? Were you always drawn to sculpture or was that an evolution? Kevin Francis Gray: I came from a very hard, working class Northern Irish family. We lived in South Armagh which is the land of the Republican Movement where the troubles began. My exposure as a young man to art was very limited, so art was something that I came to as a teenager. I went to art college where I studied for a B.A. in painting. Then I did a painting M.A. at Goldsmiths. So as soon as I finished all of my studies in aggressively attacking painting, I asked myself, 'why not start making sculpture'? RL-F: Did you have a realistic painting style? KFG: No, I didn't. I was trying to concentrate on the concept of abstraction in painting, so the work that i was doing was the extreme opposite of my sculptural work. As I came nearer to the end of my painterly investigations, I started drawing a lot. When I look back, I can see that there was a natural progression from painting to sculpture for me. However, it didn’t seem like it at the time; it just seemed like a very sharp cut. RL-F: Were there certain artists who inspired you? KFG: One of the artists who has been a mainstay throughout my life is Ad Reinhardt. I’d seen one of his paintings in the Irish Museum of Modern Art when I was young and he had a profound impact on me. I'm still a massive admirer of his work. My appreciation and knowledge of art and what I consume changes over the years. You’re constantly changing your aesthetic appreciations. RL-F: You mentioned your youth in Northern Ireland and I wonder how that formed your view of yourself as an artist and of the world? KFG: it has taken me years to realise how profoundly important growing up in a violent and dark setting of war really was and is. I think when I was growing up in that situation, my primary focus was to get out of it as soon as possible before I got involved. As a young teenager in that type of environment you are inherently involved in the war-- from petrol bomb making to many other areas. It’s almost like a passive activity, this idea of the community and your participation in the community’s struggle. So I was trying to get away from that. Ironically, however, it’s never something that leaves you, that sensitivity and that tenderness to subject matter that might be dark and challenging and difficult and aggressive. That language has been consistent throughout the entirety of my practice, but it’s only been in the last 5 years that I've been able to locate that feeling. I think that’s to do with not only maturing but also the work being more honest. RL-F: What you are saying brings to mind Kids On A Tomb (2008). I remember when I was a young teenager going to cemeteries in the middle of the night, writing poetry and trying not to be scared. There is a necessary adolescent play with death-- for you, an actual war, for me the suburban graveyard-- and dabbling with mortality with a sort of youthful embrace is a rite of passage. KFG: The sensitivity to things that are from the darker side of life is something that we all experience as young people, and I think that that language stays with you as an adult. There’s almost a privilege in being able to look at that side of life. I’m reading Henry Miller's Tropic Of Capricorn; it is very dark and anyone can access it. RL-F: Many of your previous works involved the use of skulls as visual motifs to replace the faces of your subjects. Recently, there seems to be a resurgence in the 'tête de mort' -- half of my 9 year old son's clothes have skulls on them! What drew you to that particular symbol and what does it say about us? KFG: People have come in and come out of love with the skull for centuries. It has been a symbol that has transgressed all people’s visual experience. One's relationship with the skull is also culturally varied-- you see it in different ways in latin american and northern european icons for instance. This new resurgence is one of the reasons why I don’t use it anymore because it has become so domesticated. My sons are obsessed with skulls and cross bones, zombies, and death. I feel that I’m a very positive influence on them but maybe not! The skull is one of these transcendent images that everyone taps into in some way or another. But in contemporary art it has had a particular resurgence and perhaps has gotten a bit... Overused. RL-F: The manner in which you use skulls is intriguing because they are often hidden from the viewer who has to look beneath a veil to see them. KFG: The people who I used in that particular body of work were very marginalized and very complicated people. So the veil was a comment on them as human beings--not showing their faces, not giving their identity or speaking about their circumstances-- rather than them as individuals. The sculptures of young people were very glossy and highly polished with frosty crystal veils in front of their faces, obscuring the skulls. It had an immediate, consumer product feel to it. But what lies beneath the veil, beneath the shroud is always the most profound and important. We all have veils that we present to the outside world and then when you go deeper into the person, you see the darker side. That was the idea, that when you look beneath the shining crystal surface, you discover who the actual person is. RL-F: You mentioned that the sitters were difficult. In what way were these people challenging? KFG: A lot of the young people during the veiled faces period were 'cutters, kids who cut themselves a lot. RL-F: That was one of the striking details in Ghost Girl (2007) with the lines carved in her arms behind her back which imagines the pain of the adolescent cutter. KFG: During that period there was this trend of marking the body through cutting lines into it. The concept of cutting was that it released the pain and anxiety through this weeping of the wound as well as the actual physical pain of the cut. But then, for a very short period of time in London, lots of kids started to cut because it had a sense of coolness about it. Many of the kids in those works were young black kids with no inherent mental complications. It was just that they’d taken this language and turned it into a form of urban tattooing. It had an occult feel to it. And there was also this complicated history referring back to scarification. It was all very complex, beautiful, and so heavy. RL-F: I’m curious about how you choose your subjects. Has there been a shift in who you’re looking for from the earlier work to the work that you're doing now? KFG: There has been a big shift. In the earlier work, I was speaking very directly about people’s circumstances more than speaking about the person. It’s taken me years as an artist to actually have the bravery to not feel that the history of the subject is key but rather the subject him or herself is key-- the idea of having a work stand alone just for what it is rather than have a back story. That’s why I moved away from the skull and the crystals and the cutting towards a more expressive sculptural work about these individuals who I’d met. In particular, the large portraits that I’ve done recently is a pure conversation about portraiture. RL-F: Your newer works present a visual departure from your earlier works, most notable being the exposure of the face with either the outlines being visible (India standing and temporal sitter both from 2012) or the face being unveiled entirely, as in 12 Chambers (2012). These sculptures seem more personal. Was that challenging for you not just technically but for what you must have revealed to yourself as an artist? KFG: 12 Chambers was the first piece where I literally removed the veil from the figures saying 'this is it, this is what you get'. It was incredibly scary and a massive challenge, but I feel that as an artist you have to change. If I’m going to try to take on this task of being an artist who actually does something, who says something and who is honest about it then I have to change and take these risks. Making 12 Chambers was a phenomenal risk for me both physically and conceptually. RL-F: Who were the 12 Sitters? KFG: They were a hugely varied group of people who I’d met over the last 5 years. One’s a chef, one’s a model, one’s a dancer, one’s a crack head, one’s bipolar. For that piece what was important was not what the people were or what they represented or even the idea of group strength but rather that every single figure in the group is completely isolated and marginalized and pushed out. So it’s not a single piece; it’s 12 separate people assembled together. The piece is fractured, a fractured society, a 'broken Britain'. 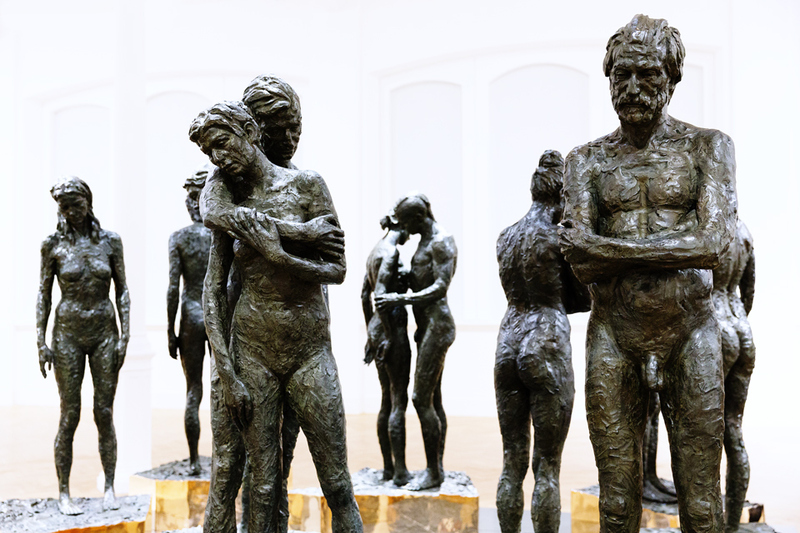 It’s the antithesis to Rodin’s Burghers Of Calais for instance, where they’re all connected as a force of men. 12 Chambers represents something separate, disparate and very urban. We both live in large cities—you live in Paris and I live in London-- but there is isolation within the urban context. RL-F: That’s true. And yet there is an intangible web that connects all of these individuals in a city which makes cities fascinating, dynamic places full of creativity. But sometimes it is like finding perfection within decay. KFG: It’s like an addiction. You know it’s wrong but you can’t not live in a city because you’d go crazy if you didn’t! RL-F: Your Ballerinas, like cities, are full of contradictions. Their feet seem to melt into the pedestal in a barbarically cruel way but they remain strong. When the ballerina in Ballerina and boy is almost crumpling under the weight of carrying the boy's body-- and arguably the weight of weightlessness that ballet demands of its dancers-- one thinks of the trauma in creating perfection. It’s unexpectedly heavy and sorrowful even as it looks light and beautiful. KFG: When I started looking at degas and his paintings of ballet dancers, I got angry-- though I love his work-- because it’s so light and romantic and graceful. Having auditioned a ballerina for this piece i see how brutal it is. Ballet is a perfect metaphor for brutality and balance, disguised as grace and élan. It’s beautiful and perfect. Ballerina and boy is a culmination of 5 years work on this idea of taking off the veil and looking beneath the surface. It was a difficult thing for me to attack since it’s so different to the work that I’d been doing in terms of urban existence and darkness and individuality, but it fitted perfectly for me. You have this seemingly beautiful situation with a ballerina on pointe but when you look closer beneath 'the surface', she’s in the most physically brutal position whilst carrying this guy on her shoulder! In ballet you’ve got these guys chucking these little girls in the air and spinning them round but in this piece this guy is lifeless and she’s holding him and she’s on pointe and her legs are about to crack. Also physically building the support in the making of this piece was challenging; we really pushed the stone to its closest point of fracture since it’s so top-heavy. RL-F: There is a definite tension between perfection and the grotesque in your work. Would you describe what your idea of beauty is? KFG: I find beauty in the most obscure and ridiculous things. So I don’t really know the answer to that. One thing that is beautiful one day could be heinous the next. RL-F: One can find sorrow in the sweetest things. KFG: I see it in the subjects that I use. One of the subjects in the 12 Chambers-- I won’t say his name-- was an intensely complicated and aggressive man. When he was in my studio smoking crack, all of my assistants had to leave; they were scared of him but I had to keep him in the studio to do his portrait. It was a really dark moment but it was one of the most beautiful portraits that I’ve ever done. There was a profound connection for me with him and a tenderness which I might not otherwise have had if he’d been a model from some agency or something. RL-F: People often have very visceral responses to your work—pleasure, pain, sorrow, transcendence. Some have likened your work to religious or devotional art. Are you interested in religious sculpture? KFG: I had a conversation recently about the recontextualisation of the neoclassical, 16th and 17th century sculpture in a modern context. It’s really impossible for me to not have those links made because the work is very neoclassical—there is a baroque opulence to the veils, even though work based around that time was very literally a representation of religion. In contemporary visual culture, religion has become more of an evolving and changeable ideology. Anything can be religious. When Bernini was making sculptures, religion was one thing and that was it; now it’s such a broad and textured landscape. RL-F: You have a keen sense of the archaic (your use of traditional materials, realism, statuary, historical references) but also the contemporary (street wear, youthful postures, the city). What is your personal relationship with ‘the street’ and urban culture? How do you navigate the city? KFG: When I graduated from Goldsmiths, I chose very specifically to live in the Hackney area of London because for me as an artist it was important to live in a place that was challenging visually. Some of the best work created by artists throughout history came from areas that were challenging at the time. I have made strong connections with people in this area-- people come by my studio regularly now who have been in my sculptures and they’ve become friends, they’re a part of my children’s lives, and we get together all of the time. There is absolutely no separation for me with what goes on outside the door of my studio and what goes on inside the door of my studio. RL-F: What’s next for you? KFG: I have a real intention of working in Paris for a year. Paris interests me because I’m convinced that beneath the veneer of relaxed, bourgeois calmness that you find in the opulent center, Paris has this very sinister heart. I also think that there is something very profound about the periphery that no one knows about. As I said before, the idea of what’s in my studio being no different from what is outside of my studio is really key to me and i think that that is what is really different about Paris—the outside remains outside; everything inside is fine. It’s pandora’s box. Even though the show at Pace just opened, I’ve been in the studio since 8 this morning working on a new body of work. I was meant to take some time off but I can’t not be here; I’ve got to be here in the studio.